Immunohistochemistry-Paraffin: CD34 Antibody (MEC 14.7) [NB600-1071] - IHC analysis of a formalin fixed and paraffin embedded tissue section of mouse colon using rat anti-mouse CD34 (clone MEC 14.7) at 1:100 dilution. The signal was developed using HRP-conjugated anti-rat secondary with DAB reagent which followed counterstaining of nuclei using hematoxylin. 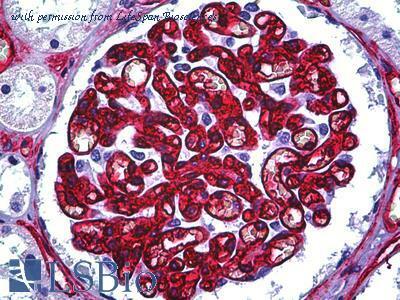 The antibody specifically generated a staining of the endothelial cells in blood vessels of the colon. Immunohistochemistry-Paraffin: CD34 Antibody (MEC 14.7) [NB600-1071] - IHC analysis of a formalin fixed and paraffin embedded tissue section of human renal cancer xenograft using CD34 antibody clone MEC 14.7 at 1:100 dilution. The signal was developed using HRP-conjugated secondary antibody and DAB reagent followed by counterstaining of nuclei with hematoxylin. Notably, the antibody specifically stained the endothelial cells of the tumor vasculature which is originating from the host animal cells (mouse). This observation was verified by including a negative control in this validation testing (see the IHC image of human renal cancer tissue section with negative signal for CD34). 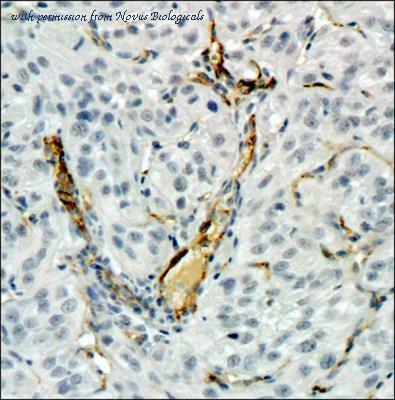 Immunohistochemistry-Paraffin: CD34 Antibody (MEC 14.7) [NB600-1071] - IHC-P analysis of CD34 on human renal cancer xenograft using CD34 antibody (clone MEC 14.7). 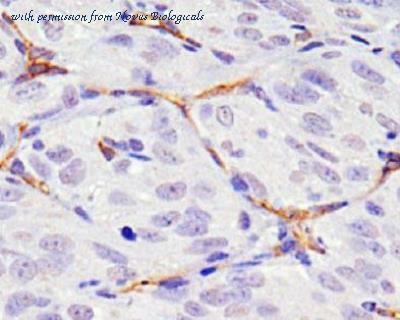 The antibody detected the endothelial cells in the tumor vasculature which are originating from the host (mouse). 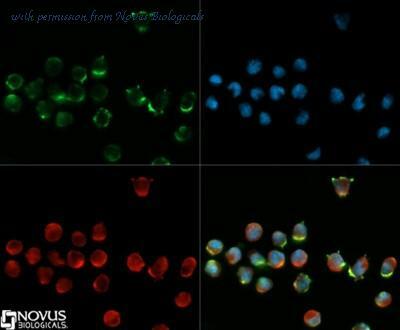 Flow Cytometry: CD34 Antibody (ICO115) [NBP2-29455] - Surface flow cytometric analysis of CD34 on KG-1 cells using CD34 antibody (red) and isotype control (green) at 0.5 ug/10^6 cells. Flow Cytometry: CD34 Antibody (ICO115) [NBP2-29455] - Analysis using the PE conjugate of NBP2-29455. Surface Staining of CD34 on KG-1 cells using CD34 antibody (red) and isotype control (green) at 5 ul/0.5 ug/10^6 cells. PPI negative cell population was gated for analysis. 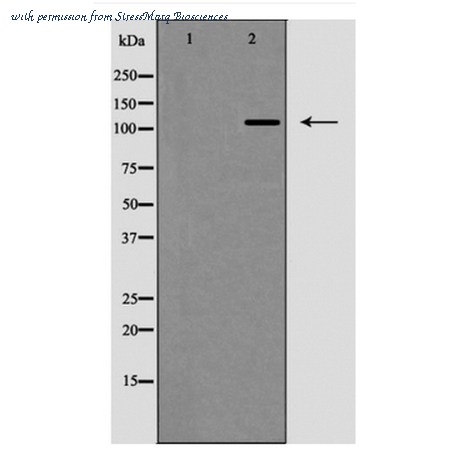 The CD34 antibody from Proteintech is a rabbit polyclonal antibody to a recombinant protein of human CD34. This antibody recognizes human, mouse antigen. 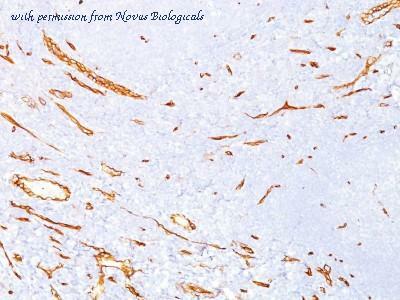 The CD34 antibody has been validated for the following applications: ELISA, IHC, WB analysis. The CD34 antibody from Proteintech is a mouse monoclonal antibody to a recombinant protein of human CD34. This antibody recognizes human antigen. 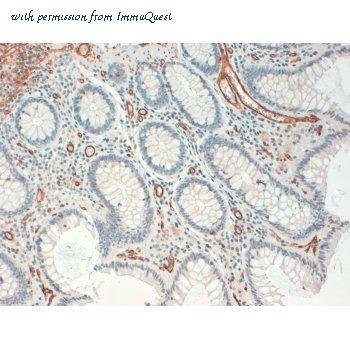 The CD34 antibody has been validated for the following applications: ELISA, WB, IHC analysis. 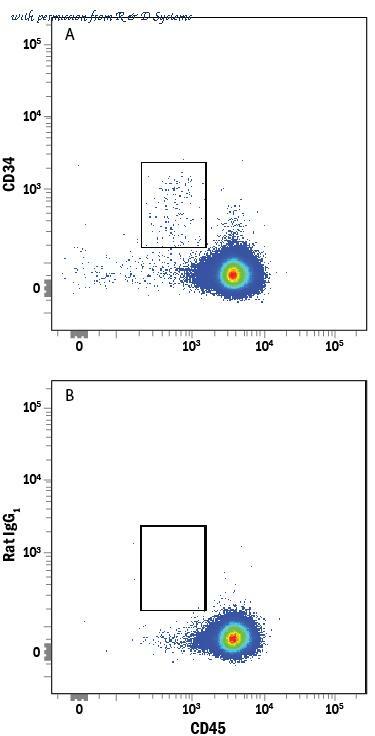 Detection of CD34 in Human PBMCs by Flow Cytometry. 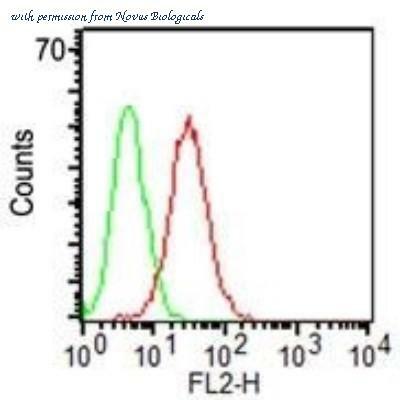 Human peripheral blood mononuclear cells (PBMCs) were stained with Mouse Anti-Human CD34 PE-conjugated Monoclonal Antibody (Catalog # FAB7227P) and Mouse Anti-Human CD45 Alexa Fluor« 700-conjugated Monoclonal Antibody (Catalog # FAB1430N ). 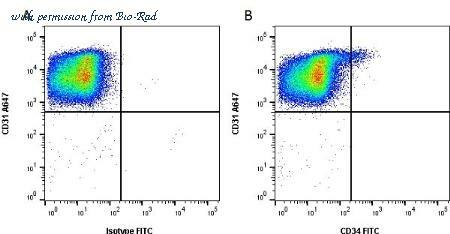 Quadrant markers were set based on control antibody staining (Catalog # IC002P ). View our protocol for Staining Membrane-associated Proteins . 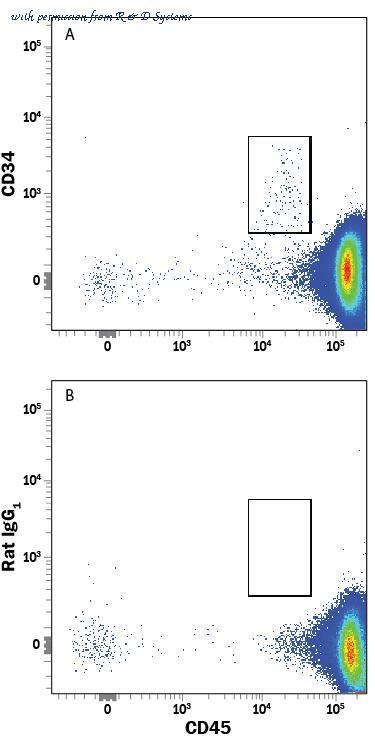 Detection of CD34 in Human PBMCs by Flow Cytometry. 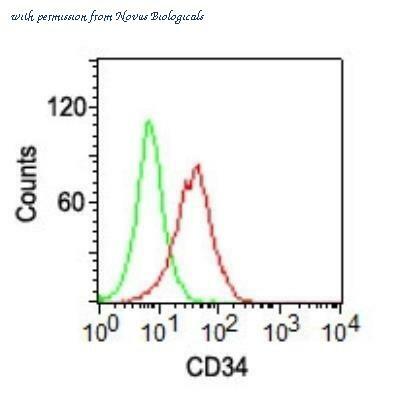 Human peripheral blood mononuclear cells (PBMCs) were stained with Mouse Anti-Human CD45 Alexa Fluor« 700-conjugated Monoclonal Antibody (Catalog # FAB1430N ) and either (A) Mouse Anti-Human CD34 Alexa Fluor« 488-conjugated Monoclonal Antibody (Catalog # FAB7227G) or (B) Mouse IgG1 Alexa Fluor 488 Isotype Control (Catalog # IC002G ). View our protocol for Staining Membrane-associated Proteins . Detection of CD34 in Human PBMCs by Flow Cytometry. 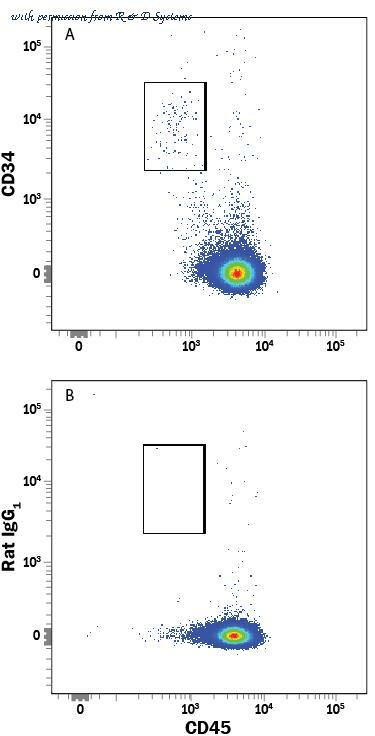 Human peripheral blood mononuclear cells (PBMCs) were stained with Mouse Anti-Human CD34 APC-conjugated Monoclonal Antibody (Catalog # FAB7227A) and Mouse Anti-Human CD45 PE-conjugated Monoclonal Antibody (Catalog # FAB1430P ). Quadrant markers were set based on control antibody staining (Catalog # IC002A ). View our protocol for Staining Membrane-associated Proteins . 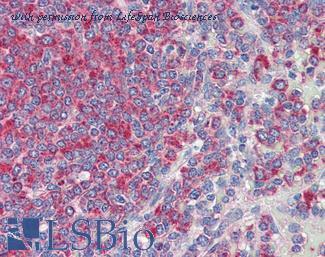 Anti-CD34 antibody IHC of human spleen. Immunohistochemistry of formalin-fixed, paraffin-embedded tissue after heat-induced antigen retrieval. Antibody concentration 10 ug/ml. 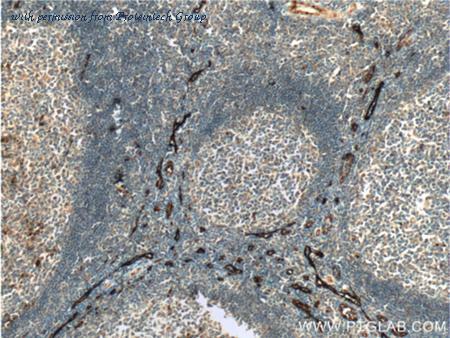 Anti-CD34 antibody IHC of human kidney, glomerulus. Immunohistochemistry of formalin-fixed, paraffin-embedded tissue after heat-induced antigen retrieval. Antibody concentration 5 ug/ml. This image was taken for the unmodified form of this product. Other forms have not been tested. Western blot analysis of Human HepG2 cell lysates showing detection of ~120kDa CD34 protein using Rabbit Anti-CD34 Polyclonal Antibody (SPC-1270). Lane 1: Human HepG2 cell lysate treated with the immunizing peptide. Lane 2: HumanHepG2 cell lysate. Primary Antibody: Rabbit Anti-CD34 Polyclonal Antibody (SPC-1270) at 1:1000. Predicted/Observed Size: ~120kDa.